Ranunculus Amandine Bonbon 42cm (also known as 'Little Frog' because they naturally grow near water) is a lovely Cerise cut flower - wholesaled in Batches of 50 stems. Ideal for floristry work & wedding flowers. Ranunculus have a rose shaped flower and are a genus of the Ranunculaceae family, which includes flowers like buttercups, spearworts and water crowfoot. All species of ranunculus are poisonous to cattle, horses and other livestock. 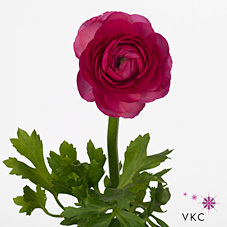 The name for ranunculus is Latin for 'little frog', ('rana' - meaning frog). Many wild species are found near water and this is probably the reason.